WALES TRAVELLED to Rome with a fragile confidence but they will have returned from their Italian sojourn with more than a little gladiatorial swagger about them. In dank, wet conditions, they had the better of the opening 40 minutes yet had only a three-point advantage to show for it at the break, thanks to Leigh Halfpenny’s trusty boot. The second-half started with Italy almost gaining a crucial score after the Welsh backs treated the ball like a hot plate but Italy failed to capitalise. Within minutes they’d driven into Italian territory and after a chip and collect from Dan Biggar. At the ruck, a dink over the top from Mike Phillips was not picked up by the Italian defence and Jonathan Davies picked up to dot down. With a ten point gap, Italy stepped up the pressure but with constant handling errors ruined any chance of building momentum. On 61 minutes, Wales drove into the Italian half and created an attacking platform, it was left to Dan Biggar to release Alex Cuthbert with a clever pass to score his second try of the tournament. With another unerring Halfpenny penalty and a 26-9 lead Wales defended well, failing to concede a try for a second successive game. The Italian job had been completed. Next stop Murrayfield. Minutes after escaping a potentially match-defining score from Italy, Wales gained some field position and Dan Biggar lofted a high ball, bravely retrieving it. 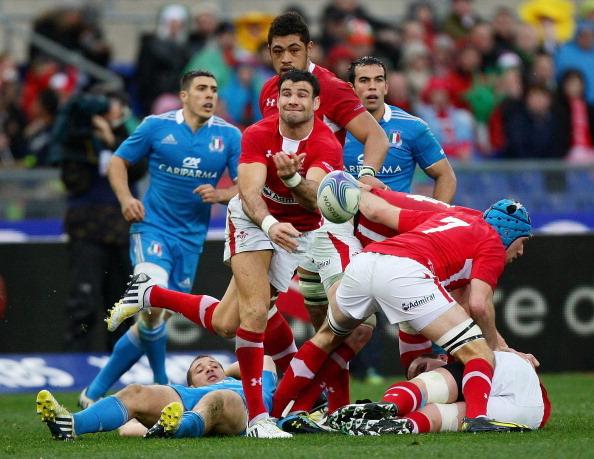 From the resulting ruck, Mike Phillips again lofted the ball over the Italian defence. Kris Burton and Edoardo Gori failed to deal with a wickedly bouncing ball and Jonathan Davies was quickest to react, gathering and dropping over the line unopposed. After Halfpenny slotted the conversion, Wales finally had the safety gap they needed to start building a lead. Thirteen may be unlucky for some but this was a coming of age performance from the Ospreys pivot on his 13th Wales appearance. 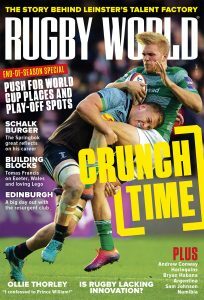 His chip in creating the winning try for George North in Paris, had helped a hitherto tentative Biggar settle in a Wales shirt and he put in a much improved performance in Rome. Steady under the high ball, twice taking difficult balls to return with interest, he was integral to Wales’ first try and second try. He also had no problem taking the ball and driving into defenders and threw himself into tackles. It was a performance that showed the boy from Gorseinon was far more than just a points machine. Bravissimo, Dan. Staying at home in Wales seems to suit the returning Cardiff Blue who has improved steadily throughout the Championship with regular rugby. In Italy, he was aggressive in the tackle, competitive in the tight and looked highly motivated. Even though he’s been written off by many, with 97 caps, you’d wager he fancies a third Lions tour rather than winning his 100th cap out in Japan. Unlucky to pick up a calf-injury late-on. While there were no show stopping line-breaks, Faletau always offers himself for contact, driving in tight exchanges and putting in a huge amount of the donkey work – he again reached double-figures for tackles. Faletau is the antithesis of a showboating No 8 but is consummate team-man and a likely tourist. The Newport Gwent Dragon has been a splendid addition to the Wales squad, putting in two tremendous shifts against Ireland and France, but here he was less influential in the loose and missed the odd tackle. He was replaced by the experienced Alun-Wyn Jones after 52 minutes. Wales’ top tacklers were Ryan Jones with 16, Justin Tipuric with 15 and Toby Faletau with 12. Alessandro Zanni was Italy’s only tackler in double-figures with 13. Italy’s top ball-carrier was Giovanbattista Venditti with 63 metres carried, followed closely by Andrea Masi with 56. Wales’ top ball carrier was Alex Cuthbert with 57 metes run, followed by George North with 31. 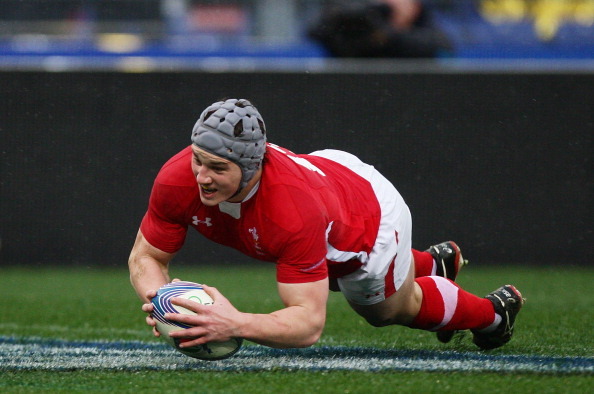 Wales – Tries Jonathan Davies, Alex Cuthbert.